Scott Santens - What is Unconditional Basic Income in One Word? I've been in a couple rooms of around 50 people or so where we were asked to describe in one word, why we believe unconditional basic income is important, and each time I was impressed with the great variety of responses, but also how certain responses were expressed again and again. Inspired by those responses, I posed the same question on Twitter, Facebook, and Reddit recently to see just how many responses to that question I could get, to get a much wider look at what people see in UBI, and which ways of looking at UBI are most universally important to people. 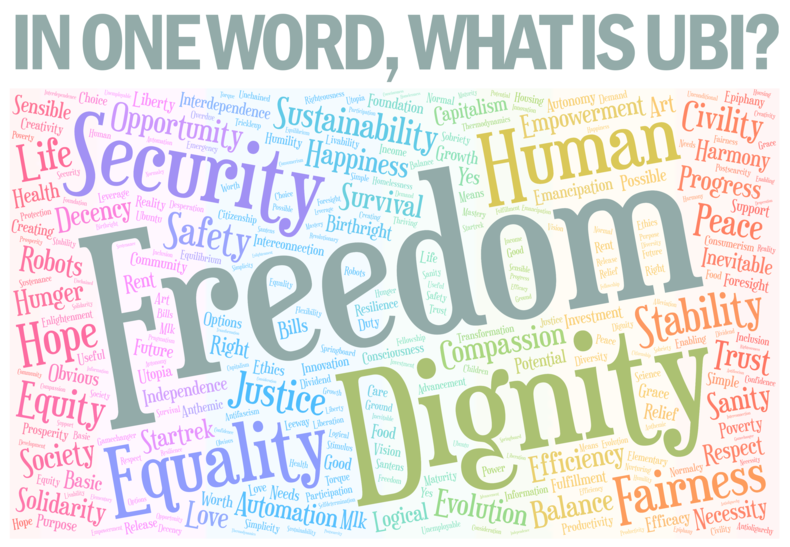 Limiting yourself to just one word, which word would you use to best describe why you support the idea of unconditional basic income? Which word in your opinion best justifies its importance? Here's a link to download an ultra-high resolution (7406 x 4320) version for whatever purposes you like. For those interested, I've also made it available on some shirts and mugs on my Spreadshirt shop. Everyone is welcome to use this data for your own research, or to create your own visualizations, or to build off it to create an even larger database. 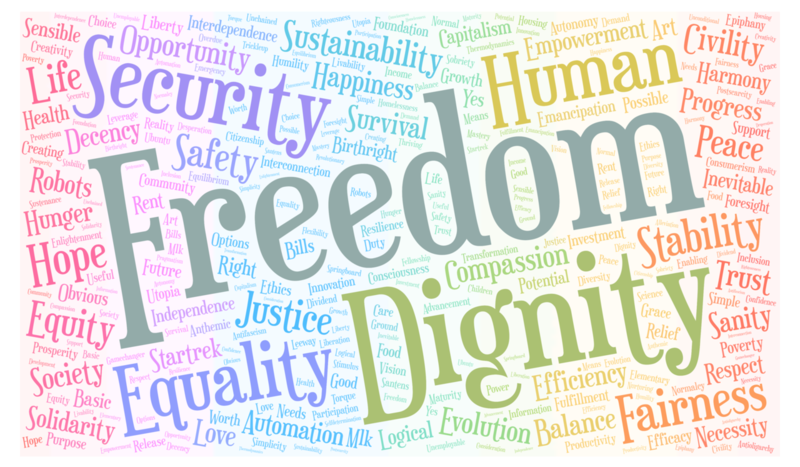 If it's one word that describes unconditional basic income to the largest percentage of people, it's freedom. May that and all the rest of the ways of describing UBI inspire you as much as it inspires me. Like my writing? Please subscribe and also consider making a small monthly pledge of $1 or one-time donation in support of my work in advocacy of unconditional basic income. Have a question about UBI? Here's a list of answers to frequently asked questions. 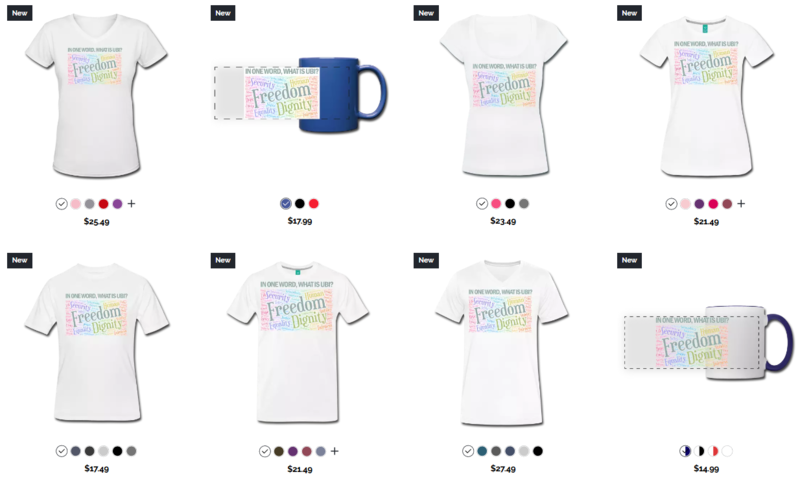 Wear your support for basic income to help spread awareness with a T-Shirt! Interested in reading a book about basic income? Here's a BIG list of what's available.